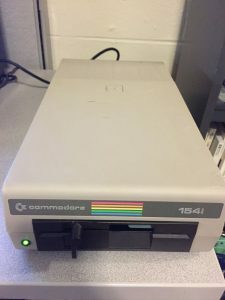 I recently pulled two classic Commodore 1541 disk drives from storage to check their condition and serviceability. Both drives had sustained physical damage falling from a storage shelf several years ago. Even before that, their condition was unknown. 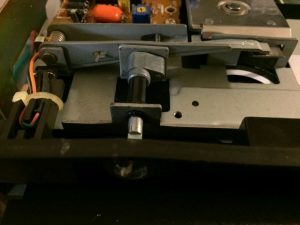 Upon closer inspection, I found that the drives had both impacted the floor face-down, meaning that there were some cracks and bent metal parts internally on each of the drive mechanisms. There were also some cracks in the plastic enclosures. 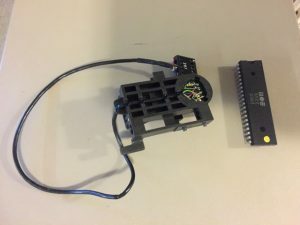 I decided that the best approach was to consider taking the best parts from both to build one working unit. The first step was to disassemble both units and select the mechanism and outside shell halves with the least damage. Luckily, one of each of the top and bottom shells were undamaged so we have a complete enclosure with no cracks. I chose the better of the two mechanisms, swapped some mechanical parts and straightened some minor bends to get a mechanism that opens and closes smoothly. The photo below shows a close up of the damaged area, unfortunately both bezels were cracked, so I chose the best of the two. Once the head was cleaned, the mechanism was mounted and I moved on to the electronics. Both drives had already been tested for working power supplies, so there were no worries there. As for the controller board, not knowing anything about the condition, and given that there were no obvious physical defects, I chose to start with the newest of the two. One board appeared to be an older revision, so I opted for the newer one. After connecting the controller, it was time for the initial testing. 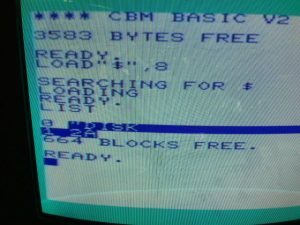 Surprisingly, the drive powered on and appeared to pass the self test so I pulled out the trusty VIC-20 and connected it up. Unfortunately, powering on the computer did not trigger the typical reset on the drive. However, I went ahead and tried to load a directory but was soon greeted with a flashing red light. Figuring that the lack of reset involved communications circuits between the computer and drive, I tested with a known good 1571 as well as with a known good C-128 since it has been a long time since we had the VIC-20 connected to any disk drives, but all that did was prove that the 1541 was the source of the communications problem. 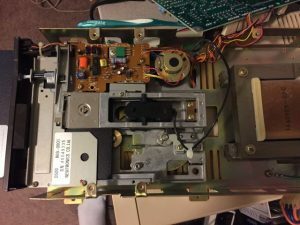 Before pulling chips, I tried swapping the entire controller board, but that did not lead to a working drive. So, on we go to swapping chips, starting with the 6522 VIA closest to the serial ports. After several back and fourth swaps I was able to isolate one bad 6522 between the two boards. Although the reset routines were now working properly, the drive would still not read a directory, leading to some head chattering and eventually erroring out. It also appeared that the newer controller board may have some other issues as well, so I stuck with the older controller with known good 6522’s which provided a consistent experience other than the read errors. After reading some other posts, since this is the Newtronics mechanism, the likelihood of a bad head seemed pretty high. Since it was easy to do the basic ohmmeter test, I went ahead and did that and was surprised to find that pin one on the head was showing open. So, back to the other mechanism that had already been scavenged, I tested that head with the ohmmeter and found that it tested just fine. So, after some more surgery to extract the working head, followed by thorough cleaning, it was swapped out. So, the head was indeed bad. Now for some more complete testing, I went ahead with a full format, as well as to test this newly formatted disk on another known good drive to make sure there was no major alignment issues. After several back and forth rounds I was happy with the performance, enough to go ahead and put everything back together. ‹ Initial documentation of hardware collections now complete!